The California Power Rangers convention Power Morphicon announced 2018 dates, a new location, and their first guest. Power Morphicon will be hosted from August 17-19, 2018 at a new location, the Anaheim Convention Center in Anaheim, CA. The convention center is located next to Disneyland and has been used by other conventions such as Blizzard Entertainment’s BlizzCon. At this location, Power Morphicon can provide more options and vacation package plans for fans attending. 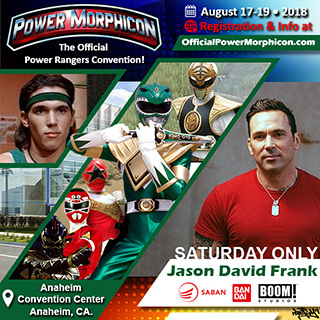 Power Morphicon also announced their first guest, Jason David Frank, who is known for playing Tommy Oliver on Mighty Morphin’ Power Rangers. Jason David Frank will be at the convention on Saturday only. Registration begins August 1st with an opportunity for fans to pre-order an exclusive Power Rangers Legacy Action Figure.